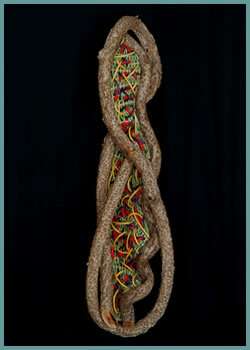 The wall-hanging sculpture styles pictured below can be woven for you in the size and colors of your choice. Tina always has some wallhangers available for immediate sale. Please contact Tina directly to make a purchase or commission her to make you a custom wallhanging sculpture. If you are interested in a wallhanger with a pocket, please view my pocket wallhanger styles. 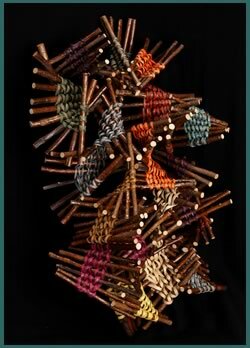 H 30" W 18" D 10"
About six to twelve alder sticks are woven together with flat reed into a fan-like shape. The fans are put together to create an interesting sculpture. The fans are in colors of browns, blues, greens, oranges, wine and natural. 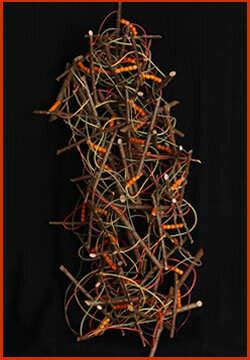 H 38" W 18" D 10"
This sculpture is a snarl of assorted colors made from round reed, orange wooden beads and alder sticks. H 38" W 10" D 7"
One continuous thick piece of bittersweet vine gives this wallhanging sculpture its shape. Woven to be viewed from both sides, this piece was done in light-green colored reeds, with peach-colored spokes. Both sides are accented with yellow and plum-colored reeds, and finished with red beads. © 2006-2017 Tina Puckett, Tina's Baskets and Woven Art, All rights reserved.